well, they look more like monsters. i didn’t plan for them to be realistic groundhogs, but these REALLY don’t look the part. 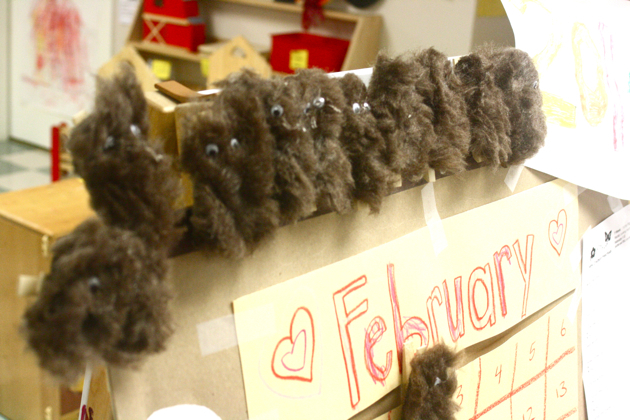 a piece of fake fur, google eyes on a clothespin so you can take your groundhog monster with you. happy day. First time here . Being a mom of a 4 yr old I really enjoyed seeing all the posts n pics here , liked ur concept of teaching alphabets . just loved ur site . Do sneak a peek at my blog wenevr time permits, its abt making cute healthy art food for lil ones ..